I am not able, nor do I intend to, explain away Japanese auteur Shion Sono’s suspenseful, horror-tinged existentialist question to his compatriots. Why do 54 girls plunge in front of an express train from platform 8? Why is there a roll of human skin (from various people) found at the (crime)scene and subsequent others? The depiction of technology generally, and the internet, TV and mobiles especially, as sinister and intrusive is nothing new, but done here with a specific purpose. Tech gizmos are seen as merely extensions of our freewill and choice. The seemingly sporadic suicides only spread, leaving a group of detectives baffled but on the trail. There are the mysterious red (female) and white (male) spots on a website, which seem to appear in anticipation of deaths. There’s also a psychotropic girl group (aged around 12) whose J-pop lyrics are there to be deciphered. Watch out also for the most androgynous, hilarious yet morbidly rabid emo-punk ego-tripper ever! His sparkles will give him away! Much exists on the WWW about the “meaning” of select, deliberately symbolist scenes. I will leave it to those more expert on the religions and beliefs of Japan to impute the implications of suicide and reincarnation. The DVD includes only a trailer as bonus material, but I recommend you watch it. I found it thoroughly misleading. 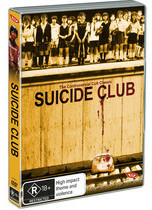 It seems to show Suicide Club as homage to the much-loved 1970s supernatural thriller. On the contrary, Sono’s film remains chillingly contemporary (beware the school roof scene, which is eerier than anything I have seen in daylight!). But there is plenty of flickering-fluorescent and noises-in-the-dark stuff to keep everyone happy. On a personal level, I enjoyed seeing shots of trains and busy neon streets as I did when visiting Tokyo. While asking many questions of the Japanese and their way of viewing the world, I think there are enough of these which can be applied to non-Japanese viewers. It’s clear I need to watch it again and I am looking forward to it and you should give it a spin, but probably with a clear and open mind.